In case you forgot just how popular the Gucci fur-lined loafers are with the fashion crowd, Gigi Hadid was spotted rocking her very own pair in NYC. The versatile flat is one of Fall's trendiest items, with many iterations popping up on the 'gram and on your favorite street style stars. Of course, Gigi got her hands on an embroidered floral version, which appears to be sold out online. 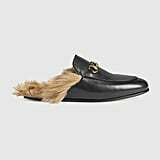 It makes sense why Gigi would pack the shoe for her travels — the furry loafer not only goes with any outfit, but also keeps the feet nice and toasty against the cold. We say it's probably about time everyone invests in a pair, so shop similar loafers below. Would You Wear the Fashion World&apos;s New Favorite Shoe?